Brock Vergakis at the Virginian-Pilot offers a piece on the upcoming court-martial of a U.S. Navy officer for espionage and other offenses. A Navy officer charged with espionage will be arraigned Tuesday after the commander of U.S. Fleet Forces Command referred the case to a general court-martial, the Navy said Friday. Lt. Cmdr. 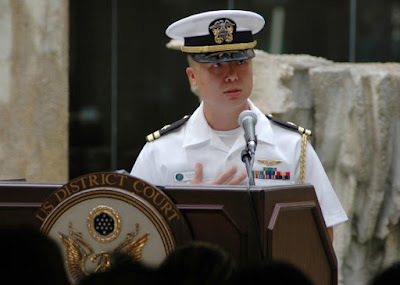 Edward C. Lin (seen in the above U.S. Navy photo) is a naval flight officer who faces two counts of espionage, three counts of attempted espionage and five counts of communicating defense information. Espionage is one of the most serious crimes in the Uniform Code of Military Justice, punishable under certain circumstances by death. The last time a sailor was convicted of the crime was in 2006, when Petty Officer 3rd Class Ariel Weinmann pleaded guilty to espionage and attempted espionage. He was sentenced to 12 years in prison. Lin was assigned to a secretive patrol squadron in Hawaii at the time of his Sept. 11 arrest at the Honolulu airport, and his prosecution has been designated a “national security case” by the Navy. Lin also is charged with wrongfully transporting classified material and failing to report foreign contacts. Fleet Forces Commander Adm. Phil Davidson dismissed charges of adultery and patronizing a prostitute.